Preheat oven to 350°F. In a bowl, combine Dinner Kit seasoning mix, 1/3 cup ranch dressing, and chicken. Stir until combined. Spoon chicken mixture into the center of Dinner Kit tortillas. Place in an 8x8 pan. Drizzle with both packets of enchilada sauce. Sprinkle with sharp cheddar and queso fresco cheese. Bake uncovered for 20 minutes, or until the cheese starts to melt and bubble. Remove and cool slightly before drizzling enchiladas with extra ranch, and garnishing with fresh chopped tomatoes and cilantro. 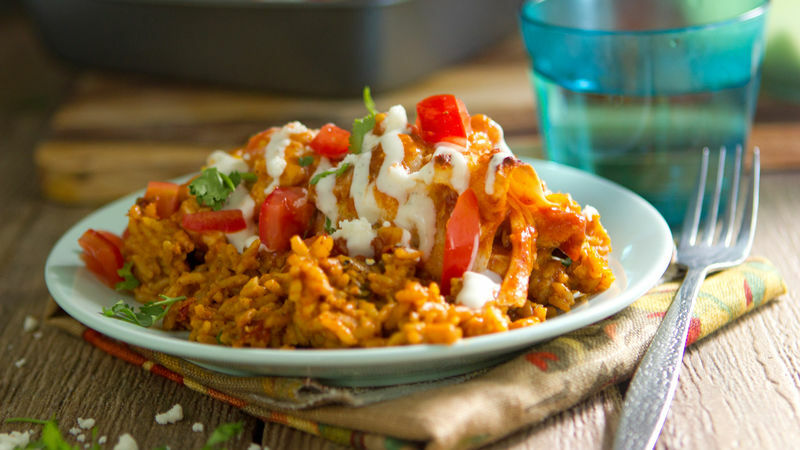 Serve with Old El Paso™ Mexican Rice. What happens when two things you already love decide to become friends? Ranch Chicken Enchiladas, that's what! Your family already pines and whines for enchiladas. Who doesn’t? Those rich and mixy sauce-slathered bites of goodness are a flavorful favorite. Everyone in your house loves ranch dressing, too? Yup, that's how it goes. Who doesn't love ranch dressing? So, we had this wildandcrazy idea. How's abouts we pull everything together and make it into one big, happy family. Ranch Chicken Enchiladas. They're good for the soul, easy to make (start to finish in 30! ), and you won't have to beg the picky eaters around your dinner table to dive in and give 'em a try. They're already a double flavorite! Lineup! This recipe starts with the most basic requests. Grab a box of the Old El Paso Enchilada Dinner Kit and you're meal is practically done. Open that box, mix some rotisserie chicken with the included seasoning packet and a bit of ranch dressing. Voila! A no-cook filling ready to go! Wrap, roll, and you're halfway there! Drizzle the included enchilada sauce. Can we talk for a moment about how much we love that the Dinner Kit comes with TWO packets of sauce, instead of just one? Looks like someone at Old El Paso is looking out for our primal needs of extra sauce. Bless 'em. Cheddar on top. Sharp cheddar. We're gonna take this recipe over the top with the addition of a second type of cheese. Look for queso fresco, a mild Mexican crumbling cheese, in the dairy aisle of most local grocers. It's so worth hunting down, because it makes the final dish look so authentic. Bake until the cheese is just slightly browned. Hola, happy vida. With enchiladas out of the oven, drizzle a bit of extra ranch up top, garnish with chopped tomatoes and cilantro, prepare your spatula. Dinner is done! Enjoy this muy bueno meal!